This is an important book for all young people concerned with war and peace in their lives and around the world. 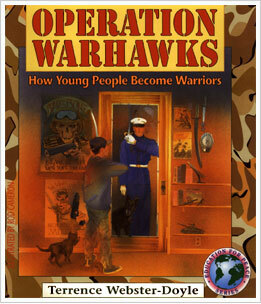 Operation Warhawks - How young people become warriors uses activities, examples, and true stories to help you understand war and the "conditioning" that goes into making young people into "Warriors"—trained to fight and kill in the armed services. Know how a young person can be turned into a Warrior Robot! Experience the Ancient Warrior within you! Understand the War Machine within your head! See how the Martial Arts can bring about peace! This book questions the conditioned belief that war is a heroic and honorable solution to resolving the problems of human relationship. This book is intended to disturb you, to "wake you up" so you can think seriously about the urge to become a warrior. War has been glorified by the media to make you think that being a warrior, a "hero" or "freedom fighter," is heroic, honor­able and right. This is a terribly distorted view of what it is to be a warrior! These glorified views presented in movies, on television, in magazines and in video games are hypnotizing you, putting you to sleep, brainwashing you—in other words, "conditioning" you to think that the honorable solution to the problems of human relationship is through brutal, violent means. Being a warrior means killing men, women and chil­dren and destroying homes and cities, because we humans cannot find other, less violent ways to resolve our problems. What is said and pictured in this book will perhaps shock you; at the least, it will make you question how human beings create warriors and war. Most adults, it seems, have "gone to sleep," have become brainwashed to accept that war is inevi­table—that it cannot be avoided. This book questions condi­tioned (automatically accepted) beliefs about warriors and war. As I wrote this book and designed the illustrations with artist Rod Cameron, I worried about what effect it would have on you—the young reader. Some people believe that you should not be bothered with such issues as war, that you would not understand it. I disagree. I do not want to frighten you, but I do want you to see what you could be heading for. It is too late to present these issues to many older people. They already have their minds made up. But I hope you are young enough to question what you are being asked to believe and obey. I cannot find words strong enough to describe how I feel about the horrors of war. Please understand that being a war­rior is a deadly serious occupation. I am sure that if we think carefully and are truly concerned about each other we can re­solve our problems in more intelligent and peaceful ways than by creating warriors and wars. I would like to develop a new occupation—Peace Educator—a person who studies the Art of Peace and teaches people how to avoid conflict and live happy lives. We have academies dedicated to the Art of War; we need to start academies dedicated to the Art of Peace. As you read this book, please seriously consider what is being asked of you. Most importantly, QUESTION! For ques­tioning will help free you from being put to sleep. If you are asleep, people can control you, even train you to be a killer! For thousands of years, people have been "put to sleep" and trained to go to war. Some people have kept themselves awake and tried to wake up others. You do not have to be brainwashed, to fall asleep—you too can keep awake by questioning. If you do fall asleep, waking up can be harsh, disturbing. The first step in "waking up" is to see that you are in a dream, that you have been put to sleep by being conditioned to accept unquestion­ingly the dreams of others, of society—dreams passed down from generation to generation. The dream is only that—a dream, just like you have at night as you sleep, except that it is daytime. Daydreaming may take many forms: the dreams of success, ambition, fame and fortune; the dreams of honor and duty, of defending one's homeland; dreams of heroes and en­emies, good guys and bad guys; dreams of glory and patriotic action, and the social respect it brings. The dream of glory, of being a warrior, is one that con­cerns me here. I, too, had been conditioned to dream this dream. I went to sleep and ended up being trained as a war­rior. I woke up in the middle of it, and it was very harsh, very frightening. The dream was all I knew. For a long time after I woke up, I didn't know who I was or what I was supposed to be. Now, being awake is wonderful! And yet I still see the sorrow, confusion and violence in those who are asleep, who live in their dream worlds of warriors and wars—a living nightmare played out each day with everyone convinced that it is all real and necessary. The terrible thing is that none of it is real or necessary. It is only a dream! And yet we carry out the horror of it year after year, generation after generation. This is why I have written this book, to wake you up, to show you that the dream of glory is a terrible illusion that we take to be real. Waking up can be disorienting, but if you are awakened be­cause another cares about you, then I feel it will be all right. And I do care about you—I do not want any young people to be hurt. You have probably already seen a tremendous amount of violence in the media. I am sorry that you have had to see it. It seems that many filmmakers only want to make lots of money by frightening you. I personally feel that they should be ashamed of what they do to hurt your minds. Please see that this book is not trying to hurt you, but to help. I want to "creatively disturb" you so you will not become a warrior—so you will not kill or be killed. Being a warrior is a bad dream which could become a terrible nightmare if you go to war. If I can begin to wake you up with what is written and pictured here so you will question all those people who tell you that the way to peace is through war, then I have done my job. If only a few young people decide not to become warriors and hurt other human beings, I will feel happy. It's now up to you. This book lies before you. It is an "adventure," a challenge to look at how young people like you become warriors. My only hope is that at the end you come away with the one most important question burning in your brain "Is there another way?"